A five-year-old's experiences of the Khmer Rouge's reign of terror in Cambodia. On the back of a string of well-intentioned misfires that would likely have stalled the careers of most women filmmakers, Angelina Jolie finally delivers a work of promise in her adaptation of Cambodian activist Loung Ung's account of life as a five-year-old under the terrifying regime of the Khmer Rouge. Following a vague opening montage that details the American military's bombing campaign in Cambodia, Jolie takes us into the middle class Phnom Penh home of Ung (Sareum Srey Moch) and her family as the Americans withdraw and the communist Khmer Rouge takes over. Redistributing wealth and possessions, the KR force Ung's family to leave their home and relocate to a work camp. There, Ung's father (Phoeung Kompheak) attempts to keep his family safe while keeping his identity as a former government worker a secret from the KR, who are summarily executing anyone associated with the previous regime. This is clearly a very personal project for Jolie, who fell in love with Cambodia and its people while shooting Tomb Raider. She holds Cambodian citizenship, and one of her adopted sons is a native of the country. Perhaps this explains the lack of political context presented in First They Killed My Father. Pol Pot's name is never mentioned, as though Jolie wishes to banish the dictator from history, and the opening montage creates the impression that the US was solely responsible for his rise. While no excuses can be made for the disgusting actions of the KR (which are respectfully kept off screen here), they didn't appear out of thin air. What drove rural farmers to revolt with such savagery against the country's urban elites? You won't find the answer here, as in Jolie's film the members of the KR are as one-dimensional as Star Wars stormtroopers. Of course, such complaints can be dismissed by the fact that Jolie's film is told through the eyes of a five-year-old girl, for whom politics and class conflict are meaningless. This could have been a very exploitative approach, but thankfully Jolie resists any didactic voiceover narration from her child protagonist, allowing Moch's highly expressive face to tell the story. Much of the film is concerned with the day to day life of Ung as she performs a series of demeaning duties which no child should be tasked with, from planting landmines to learning to fight 'with revolutionary spirit.' Jolie's camera stays close to Moch's face, as though influenced by the Oscar winning Hungarian Holocaust drama Son of Saul, but she's not so stubborn as to deny us a wide shot when one is required. There are times when Jolie's direction still feels rough around the edges, such as the distracting jump cuts of the opening act, but for the most part this is a giant artistic leap for the actress turned filmmaker. The movie's most effective and affecting scene comes when Ung's father is requested to leave with a pair of soldiers. They tell him he's required to work on a bridge, but he knows he's being taken away for execution. It's beautifully underplayed, as Ung watches her father stoically bid farewell to his family, and the lack of outward emotion on display makes it all the more tragic, horrifying and infuriating. If Jolie can embrace such simplicity and drop the film school affectations, she may be ready to take the baton from Clint Eastwood as America's premier actor turned director. 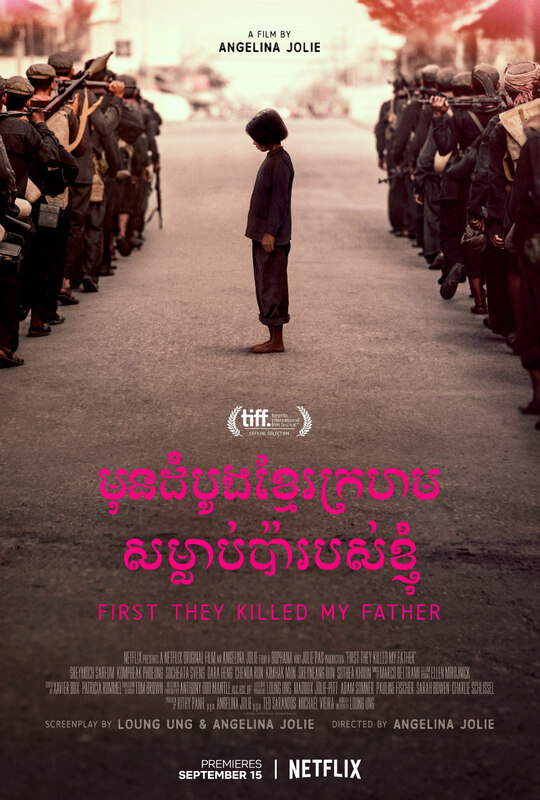 First They Killed My Father is on Netflix now.